Becoming a top seller on Amazon isn’t easy. Here’s how Ordoro helps you hit your metrics and run your fulfillment operation like clockwork. Amazon offers a few fulfillment methods to sellers, each of which interacts with the marketplace differently. You can mix and match as you please, and rest assured, we play well with each model. Fulfillment By Amazon, one of Amazon’s most popular programs, allows sellers to ship inventory to an Amazon fulfillment center for storage and shipping. When an Amazon order arrives, everything that comes next is in their court — they pick, pack, and ship the order to the customer, all while handling customer service and returns to boot. Connect your Amazon Seller Central account to Ordoro, and pick and choose which products you want fulfilled by FBA. Orders containing such products are automatically relayed to FBA for fulfillment, and tracking information is sent back to Ordoro. If you ever decide to change a product that is fulfilled in house to FBA, there are manual steps you can take in app to prevent ghost listings from occurring. Break down the fulfillment speed of FBA, and compare them with your other suppliers through our Analytics. It’s critical that you maintain a solid Inventory Performance Index score. Our inventory features make it easy to identify which of your FBA products are top sellers or dust collectors, helping you avoid additional charges like long-term storage fees. Just because an order is placed on another channel doesn’t mean Amazon won’t touch it. It’s possible to fulfill orders made on other platforms — like Shopify or BigCommerce — from Amazon’s warehouses. Doing so harnesses Amazon’s fulfillment power to quickly deliver third-party orders around the country. We act as a hub for all of your channels. Multichannel is our middle name, so you can bet that we make it easy for you to manage your multi-platform operation. Connect as many integrated sales channels as you need, from carts like Shopify and BigCommerce to marketplaces like eBay. Integrate with Amazon and have your orders insta-routed their way for fulfillment. When an order is shipped, a tracking ID is sent right back to the sales channel of purchase so the customer can be kept up-to-date. Take a look at our open API and build any integration with Ordoro that you need, whether it’s a home-grown storefront or a brand new sales channel. Shipping orders within a couple days at a near 100% success rate? Amazon definitely wants you to become a Seller Fulfilled Prime merchant. By becoming one, you gain access to those lucrative Amazon Prime customers and all the benefits that come with them, like that blue Prime badge next to all of your listings. That said, the catch is that you must manage and fulfill all of your Amazon Prime orders on your own. And that means meeting a few benchmarks. 99% On-Time Rate — Your A+ is guaranteed with us. Use our Automation Rules and Shipping Presets to automatically organize and process Amazon Prime orders the second they make their way into the app. Less than 0.5% Order Cancellation Rate — Our inventory tracking, syncing, and purchase order features will keep you aware of low inventory and prevent you from experiencing a stockout. Use Amazon Buy Shipping Services for 98.5% of Prime Orders — No worries, you can use Amazon’s shipping services directly through the app. Plus, you can print out those Amazon Prime labels in triple-digit batches directly through us. Deliver via Amazon-Supported SFP Carriers — We’ve got ‘em. Needless to say, SFP sellers are held to high standards. We hold our platform to the same. Here’s how else we make fulfilling through SFP simple. Easily prioritize your SFP orders within Ordoro, and sort by shipping status or activity to quickly identify any delayed shipments. Minimize any risk of fulfillment errors and ensure that every shipment has the correct SKUs and quantities needed by using our Barcode Scanner. Automatically retrieve tracking ID for every shipped order and have it auto-sent to your customer to keep them in the loop. You’re paying for free Prime shipping, so it’s critical that you keep tabs on your shipping costs. Break down your spending by shipping carrier and method with our Analytics. Unlike other shipping and inventory management systems, we do NOT charge extra fees on Amazon Prime orders. Pure and simple, you can sell your products on Amazon and ship them yourself once an order is placed. Fulfill in-house, through a 3PL, or dropship if you’d like — it’s up to you. But keep in mind that you do not have access to Prime customers and benefits. We support all kinds of fulfillment models, whether you’re dropshipping certain products or processing every order in-house. Here’s how we help you fulfill as you see fit. Automatically track and sync your in-house inventory, and set up Automation Rules and Shipping Presets to accelerate your workflow. You’ll be paying for the shipping, so be sure to keep your costs low. Our discounted shipping rates of up to 67% via USPS have you covered. Bring some branding in and customize your packing slips and labels while you’re at it. Identify your top-selling products with our Analytics dashboard. If you’re storing your product in a 3PL warehouse or purchasing directly from your supplier, use our Supplier Feeds and connect directly to them for real-time quantity updates. Link dropshipped SKUs to their vendors within Ordoro, and decide whether you want them auto-routed or manually routed their way. When an order arrives containing dropshipped and non-dropshipped products, the app will split it for you, routing those that are dropshipped to their designated vendors. Using a supplier to dropship specific products? Set up a Vendor Portal that allows them to fulfill orders all on their own. Live by the Buy Box, die by the Buy Box. 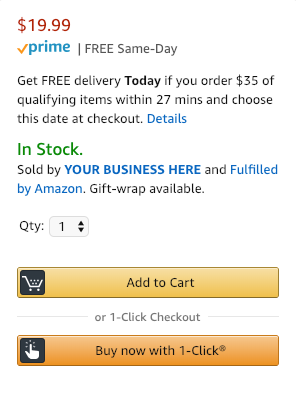 It’s the box that showcases a product’s price, and it includes the “Add to Cart” button an Amazon shopper hits when they want to buy. The Buy Box is prime real estate, and you have to win the coveted spot if you want the greatest chance of selling. Amazon prizes low prices; that’s a given. But they also place plenty of weight on specific metrics that you must meet in order to get priority over the box. We’re here to help you excel in each of them. Fulfillment Method — FBA and SFP sellers have the greatest chance of securing the Buy Box. We play extremely well with both programs. Landed Price — This is the total price of your product plus shipping costs. Keep those shipping costs down with our heavily discounted shipping rates (up to 67% with USPS). Shipping Time — You guessed it, it’s how long it takes you to ship an order. Customize and streamline your workflow as you see fit with our host of shipping features. Valid Tracking Rate — For every order that goes out, Ordoro issues a valid tracking ID that’s constantly updated and relayed to the customer until arrival. Late Shipment Rate — Don’t worry, you won’t be missing a ship date using the app. Simply log into your account, view your ready-to-be-shipped orders, and process them. Inventory Depth — This is how often you as a seller run out of stock. Our inventory features have your back; the app constantly tracks product quantities with every outgoing shipment and resupply, and alerts you to low-stock SKUs. Cancellation Rate — Just like SFP, access to the Buy Box is impacted by how often you cancel an order. We give you all the tools you need to get every order processed and shipped correctly and quickly.